Toon-Doku is easy to maneuver with good download times. The layout is understandable and the animation in the background is constant. 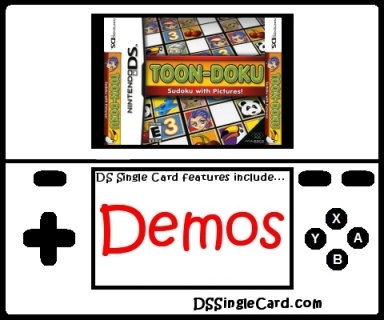 A bonus ability allows for the host's Nintendo DS system to broadcast the game demo while closed, meaning that battery life is preserved (since the screens are effectively off). The menus in Toon-Doku are easy to understand, easy to navigate, and self-explanitory. The download is explained well and located in the spot you'd most expect it to be in. The areas you tap are large and well-defined/separated. The game requires double-tapping instead of single tapping, which cuts down on accidental mis-taps. There are three "issues" I had with this game while playing, two were as a result of "creative decisions" and one was a programming issue. The programming issue was a problem I had with trying to highlight a square by tapping it. Often, the tap did not take the first time, and tapping multiple times would instantly be considered an attempt to zoom in. The first problem that came as a result of someone's decision was that you can drag a copy of an image off of a locked square and drop it in another square. This happened (unintentionally) so much the first time I played, I ended up with more than twenty errors simply by accident. The final problem, also likely the result of some decision-making process, was the choice to leave that vast majority of the upper screen either unused or displaying the "Toon-Doku Distraction System" logo (the Distraction System is only available in Multi-Card play). Why not keep the bottom screen zoomed in and have the upper screen display the entire Toon-Doku puzzle (zoomed out)? Toon-Dokus sound is nice - a little repetitive, but a pleasant surprise. There are games that go into a lot more depth than Sudoku games with far worse. Graphically, the look of the game is good. Most of the images are easy enough to discern from one another, even if you do have to zoom in from time to time to do so. The variety of images is pretty good, especially for a downloaded demo. The ability to switch to numbers in the demo is very nice, as is the ability to switch to a different set of images is you don't like the set you've been given, but you can't go back to the previous image set. There are a lot of Sudoku games for the DS (there'll be ten available by mid summer 2007). Some of them allow you to write in numbers. Some of them are combined with other games and/or activities. Some of them don't even allow notes (Marks). With Toon-Doku, you can play the standard Sudoku with numbers, but you can also do something with Toon-Doku that you can't with other Sudoku games - use pictures. After all, there is no math, so the numbers are used as pictures anyway, aren't they? In the single-player experience, you can even create your own images in a 32x32 grid. This game's got a lot of options, with a great random puzzle generator and the ability to set your own difficulty right down to the number of locked images on the board. Even if you don't like the images, this is still a great Sudoku game. You could design numbers (1 through 9) using a font of your creation, maybe even with a different color for each for quick refence. If you don't like using images, you don't have to, but then you're just missing out on the additional challenge of it. Correct the sensitivity when tapping a square to highlight it. Remove the ability to drag a copy of an image from a locked square. Utilize the upper screen by putting a copy of the puzzle, a zoomed in image gallery, or in some other helpful way. Allow players to undo an image change and return to their previous image set. Add in a feature to use Nintendo's Wi-Fi Connection for image trading.